In the end, like a well-made film, it all went according to the script: a David versus Goliath battle saw the little guy triumph, Kathryn Bigelow scored a historic first for female film-makers, and The Hurt Locker walked away with six awards, including Best Picture and Best Director, at the 82nd Academy Awards in Los Angeles. Ms Bigelow’s thriller about a US Army bomb disposal squad in post-invasion Baghdad cemented its claim to be perhaps the first truly great film to come out of the Iraq war, losing out to the $300m science-fiction blockbuster Avatar in just one of the seven categories where they were paired against each other. The victory represents an affirmation of artistic endeavour over commercial might: The Hurt Locker was an independent movie made for just $15 million, which generated $20 million at the box office; its big studio rival boasts a budget 20 times that size, and ticket sales of $2.5 billion, making it by some distance the most lucrative film ever produced. It was also in keeping with expectations, which had Hurt Locker as a marginal favourite to take the night’s two big prizes. Indeed most of the major awards ended-up where expected: odds-on favourites took every acting gong, with victories for Sandra Bullock, Jeff Bridges, Christoph Waltz and No’Nique. In the absence of an upset to steal headlines, historians will remember 2010 as a red-letter Oscars for women in film. Ms Bigelow becomes the first ever female winner of the Best Director Oscar, an achievement which seems all the more of an achievement when you consider that James Cameron, the director of Avatar, happens to be her ex-husband. Aside from the Best Picture and Best Director Oscars, The Hurt Locker won for Best Editing, Best Sound Editing and Best Sound Mixing. 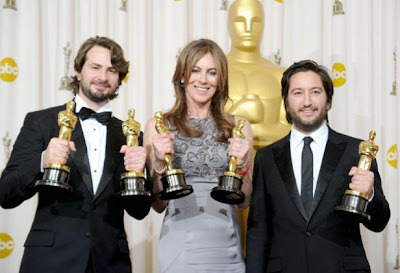 Its writer Mark Boal, a former journalist who came up with the idea for the tale while embedded with US troops, won for Best Original Screenplay. The night’s other leading lady was Sandra Bullock, who was named Best Actress for her performance as a Southern housewife who adopts a homeless youth and helps him become an American Football star, in The Blind Side. Ms Bullock’s long career has seen her produce many commercial hits, but far fewer critical ones. And her victory came just 24 hours after she was also named the “worst actress” of the year at the 2010 Razzie awards, making her the first ever performer to win gongs at both events in the same year. A note of politics was injected into proceedings by the comedian Mo’Nique, who was named Best Suppporting Actress for her turn as the abusive mother of a black schoolgirl in Precious, which also won Best Adapted Screenplay. After winning the award, Mo’Nique, whose real name is Monique Imes-Jackson, dedicated it to Hattie McDaniel, the first black Oscar winner who in 1940 was forced to sit in a segregated seating area at the Academy Awards. “The reason why I have on this royal blue dress is because it's the colour that Hattie McDaniel wore in 1940 when she accepted her Oscar,” she said. The reference to Ms McDaniel, the daughter of slaves who played Mammy in Gone With the Wind raised eyebrows among viewers with a knowledge of Oscar history. The Academy has always controversially refused, for reasons that remain unclear, to replace the pioneering actress’s Oscar trophy, which was left to Howard University but lost during a civil rights protest during the 1960s. That, however, was about as edgy as things got, at an event that was a touch short on genuine surprise. The night's two other big acting winners had both already taken home the bacon in pretty much every previous awards event this year. Jeff Bridges was named Best Actor honoured for his portrayal of alcoholic country music star Bad Blake in Crazy Heart. Christoph Waltz, an Austrian actor previously-unknown his native country, won Best Supporting Actor for his portrayal of a Nazi officer in Quentin Tarantino’s Holocaust fantasy Inglorious Basterds. Elsewhere, the Pixar film UP won Best Animation, as was widely expected, and Best Original Score. The three wins that were managed by Avatar, which like The Hurt Locker had been nominated for nine awards, came in technical categories. After years of struggling with historically-declining TV radings, the Oscar show’s organisers experimented with an old-school style of show presented by Alec Baldwin and Steve Martin. For the first time since 1988, presenters of awards said “and the winner is?” rather than “and the Oscar goes to?” But while the opening song and dance routine and initial salvo of jokes hit the mark, the 3 ½ hour ceremony lost some momentum towards the end, a development not helped by the absence of any serious upsets. In one notable departure from recent years, it was also a notably poor year for British hopes. The Wallace and Gromit animator, Nick Park, lost out in the Best Animated Short category, the first time he has not won an Oscar for which he’s been shortlisted. Carey Mulligan, the star of An Education was overlooked, along with the BBC film’s screenwriter, Nick Hornby. So too were Armando Iannucci and his co-writers of In the Loop and Colin Firfth, who was up for Best Actor. The only British winners were Ray Beckett, for Sound Mixing, and Sandy Powell, the costume designer for Young Victoria, who has now been nominated for a total of seven Oscars, and won a hat-trick of them. “I’ve already got two of these, so I’m feeling greedy,” she joked, on being presented with the trophy.